Elderberry (Sambucus nigra) has been an influenza remedy for hundreds of years. 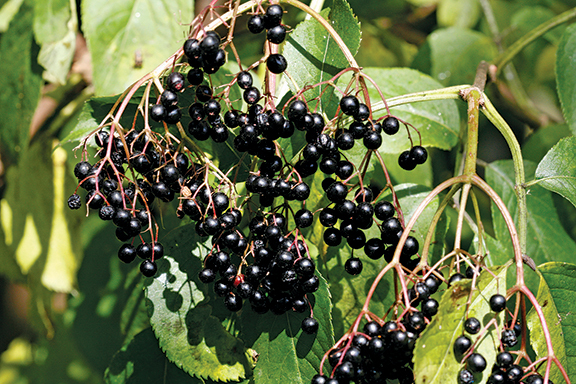 Elderberry (Sambucus nigra) has been a traditional influenza remedy for hundreds of years. I first learned about using elderberry syrup as a flu treatment a few years ago from a friend. I researched it for myself and found that elderberry inhibits the replication of the flu virus, a fact which has been confirmed by many laboratory studies. Sterilize four quart-size canning jars and one pint jar in boiling water (or an equivalent in other size jars) for 5-10 minutes. Warm the elderberry juice to 150-180° F — hot, but not boiling. Stir in the honey, and continue stirring until it is completely dissolved. Pour into sterile jars. Wipe the sides and rims clean, cap, and label. Store in a cool, dark place. Tip: To reconstitute dry berries and use for juice, put 1 cup of berries in a quart jar and pour 2 cups of boiling water over them. If they soak it up, add a bit more. Place in the refrigerator or a cool, dark place for 24-48 hours. Then strain through a clean cloth, squeezing every bit of liquid out that you can, even twisting the cloth to get the last drop. If you can’t get seven cups of the juice, you may rinse the jars with a small amount of clean water and add that to make up the difference. As a preventative during flu season, take 1-2 tablespoons twice a day. As treatment for flu, begin dosing at the first symptoms (fever and achy feeling), taking the same dose as above every 3-4 hours until symptom-free for a week. For children under 12, give half the adult dose. For toddlers and infants, talk to your physician. Follow instructions for original recipe, just leaving out the vodka. Stir until the sugar is dissolved in the hot juice, then bottle. The recipe with honey and vodka produces around 4½ quarts of elderberry syrup. Cost of ingredients in my area is $15 per quart for honey, $8 for the vodka, and $10 plus shipping for dried elderberries bought from Monterey Bay Spice Company (www.herbco.com). Estimated total: $50, which is around $5.50 per pint. The non-alcoholic variation requires refrigeration, but I have kept the original recipe in my pantry for up to three years, and the only noticeable change was a slight reduction in the amount of liquid from evaporation. My husband and I have not had the flu since I started using elderberry. Having a few jars of elderberry syrup in my pantry gives me a sense of security … I am prepared for flu season, ready to keep myself and my family healthy in a natural way.